With Arsenal’s victorious appearance at Wembley on Saturday the club’s record at Spur’s new ground is unsurpassed. We originally published this post in 2014 before the FA Cup semi-final against Wigan. It’s now been updated to take into account the subsequent games at Wembley since then. In this update we’ve added a couple of programmes from previous Wembley appearances. When Arsenal took to the field for the FA Cup final against Chelsea on 22 May, it was the Gunners 51st appearance at Wembley. This meant Arsenal pulled further away from Manchester United who have appeared 49 times. Arsenal played at the original Wembley Stadium 41 times which is a record that cannot now be taken away from them. 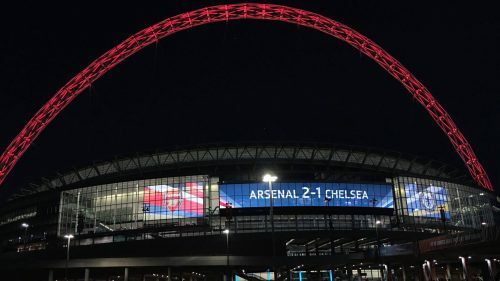 The record for most appearances by an Arsenal player at Wembley is 24 held jointly by Tony Adams and Nigel Winterburn. Including his international appearances, Adams appeared more times at the original Wembley Stadium than any other player. Reg Lewis has scored more goals than any other Arsenal player at Wembley with a grand total of six – four in the Football League Cup (South) final in 1942/43 and two in the 1949/50 FA Cup final. How on earth could you have forgotten that journey from hell? The one when the signalling equipment between Newport and Cardiff had been vandalised? We spent about 10 hours on the train all told that day. Left Paddington on a train just before 10am and running like loonies up the road to the stadium when we got off the train and heard them playing the National Anthem. The origin of the “He knocked John Terry out” chant for poor Diaby who at that point looked like he was going to be the second PV4 … until Dan Smith tried to amputate his foot on the pitch. Only good thing to be said about it all is that one of the MPs for Islington, Jeremy Corbyn, took up the case and everyone I know who travelled by train got their full fare refunded. Because it was played in Cardiff ! Well spotted Alex and Jamie. I’ve updated the table. What about the Man.City Charity shield this year 3-0? That was played at the Millennium Stadium in Cardiff. I have to admit that I originally thought it was at Wembley.